- High grinding efficiency results in low grinding costs. - Durability facilitates high precision grinding operations. - Large stock removal achieves heavy grinding such as creep feed grinding. 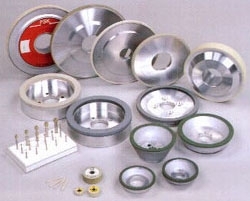 MetaCeran: This is a type of bond developed by FSK for Diamond & Borazon Wheels, and combines the fast cutting quality of Vitrified bonded Borazon & Diamond Wheels and shock-resistant cutting quality of Metal bonded Borazon & Diamond Wheels.